The gold medals in the Architecture, Computer Science, Mathematics, Music Composition and Physics categories. The silver medals in Medicine & Health and Biology. The bronze medals in Chemistry and Entrepreneurship. The medalists will each receive cash prizes ranging from $1,000-$2,000 and were given an Apple iPad at the awards reception. The listing of all of the national medalists is found below. The medalists were part of a group of 17 area high school students that won local gold medals at the DuPage County ACT-SO local competition that was held in March. The students vied for honors against more than 700 other local gold medalists from around the country at the National ACT-SO competition. The awards ceremony was hosted by DeRon Horton, star in the movie DIRT, and Netflix series Dear White People. ACT-SO alumni and actor Anthony Anderson from the award-winning television show Blackish stopped by the national awards ceremony and gave encouraging words to all of the participants to follow their dreams. DuPage County ACT-SO chapter participants from Will, DuPage, Kane, Kendall, and Cook counties marched into the awards ceremony along with their program leaders: Chairperson, Dorletta Flucas Payton, and Co-Chairperson, Thomas Reed, to chants of “Du-Du, DuPage” and cheers from the crowd and supporters. ACT-SO (Afro-Academic, Cultural, Technological and Scientific Olympics), is a year-long program that was created to encourage high academic and cultural achievement among high school students of African descent. The primary focus of the program is the development of projects for competition in categories in the areas of STEM, Business, Humanities, Performing Arts and Visual Arts. Mentoring and academic enrichment are key objectives in this endeavor. The program owes much of its success as the leading ACT-SO STEM program in the nation to its relationship with Argonne National Laboratory. This is the fourth year that Argonne and DuPage County ACT-SO have partnered for the Argonne/ACT-SO STEM Mentoring and Research Program. Each high school ACT-SO STEM student is paired with a scientist from Argonne National Laboratory in Darien. Argonne and the mentor provide guidance, resources and facilities for the students’ research. In addition to one-on-one mentoring, the program brings in professionals every month to expose the students to careers in various STEM areas. Middle and high school students who want to participate in DuPage County ACT-SO’s academic year program should attend one of the orientation sessions; the first one will be at 3 p.m. on Saturday, August 25th, at the College of DuPage in Glen Ellyn. The information flyer is available on the program’s website: www.dupageact-so.org. DuPage County ACT-SO is a program of the DuPage County Branch of the NAACP. Since its 1979 inception, the local program has partnered with the College of DuPage. Key sponsors and partners of the program include Argonne National Laboratory, Glenbard High School District 87, Glenbard South High School and Comcast. The Afro-Academics, Cultural, Technological and Scientific Olympics (ACT-SO) is a major youth initiative of the National Association for the Advancement of Colored People (NAACP). Founded in 1978, by the renowned author and journalist, Vernon Jarrett, ACT-SO provides a forum through which African American youth demonstrate academic, artistic, and scientific prowess and expertise, thereby gaining the same recognition often reserved for entertainers and athletes. The objective of ACT-SO is to prepare, recognize and reward African-American youth who exemplify scholastic and artistic excellence. NAACP branches and youth units throughout the country conduct annual competitions for students in grades 9 - 12. Gold medalists from the local competitions then compete against gold medalists from other cities around the nation at the National ACT-SO Competition that is held during the NAACP's Annual Convention in July. Below is a table which includes the information for all of our Gold, Silver and Bronze Medal winners. (Naperville, IL) – Fifty-one students from 13 area high schools competed for top honors in various categories in the fields of STEM (Science, Technology, Engineering and Mathematics), Business, Humanities, Performing Arts and Visual Arts at the 2018 Annual DuPage County ACT-SO competition, which was held at the College of DuPage on Saturday, March 17th. ACT-SO – the Afro-Academic, Cultural, Technological and Scientific Olympics – is a year-long program that was created to encourage high academic and cultural achievement among high school students of African descent. The program features three components: mentoring, academic enrichment, and a local competition. More than 400 attendees, including parents, ACT-SO alumni, volunteers, partners and local elected officials celebrated the hard work of the 2017-2018 DuPage County ACT-SO students at the Awards Banquet, which was held the next day at Bolingbrook Golf Club. During the banquet, seventeen high school and five middle school students from the Jr. ACT-SO program were announced as gold medal winners, along with numerous silver and bronze medalists. Argonne National Laboratory was cited as a critical part of the STEM (Science, Technology, Engineering and Math) students’ success. This is the fourth year that Argonne and DuPage County ACT-SO have partnered for the Argonne/ACT-SO STEM Mentoring and Research Program. Each ACT-SO high school STEM student is paired with a scientist from Argonne National Laboratory in Darien, who provides mentoring and guidance for the student’s STEM research. The research takes place on site at Argonne. In addition to one-on-one mentoring, the program brings in professionals every month to expose the students to careers in various STEM areas. The Seventeen DuPage County ACT-SO High School Gold Medalists that were awarded twenty-one gold medals. Photographer - Michael Henderson, Sr.
DuPage County ACT-SO is a program of the DuPage County Branch of the NAACP. Since its 1979 inception, the program has partnered with the College of DuPage (COD). COD and other key sponsors and partners including Argonne National Laboratory; Glenbard District 87/Glenbard South High School; The Village of Bolingbrook and its mayor, Roger C. Claar; Jack and Jill of America West Suburban Chicago Chapter; Dr. Benny and Mrs. Kim White; Comcast; and the West Towns(IL) chapter of The Links, Inc.; were all recognized at the banquet for their support of the program. The next step for the high school gold medalists is to prepare for the National ACT-SO Competition, which will take place in San Antonio, Texas in July, 2018. There, the DuPage County gold medalists will compete against approximately 600 other gold medalists from around the nation. The not-for-profit organization is now shifting to focus to raise the rest of the funds needed to send the gold medalists to the National ACT-SO Competition (about $1,000 per student). Donations can be made on their website: www.dupageact-so.org. 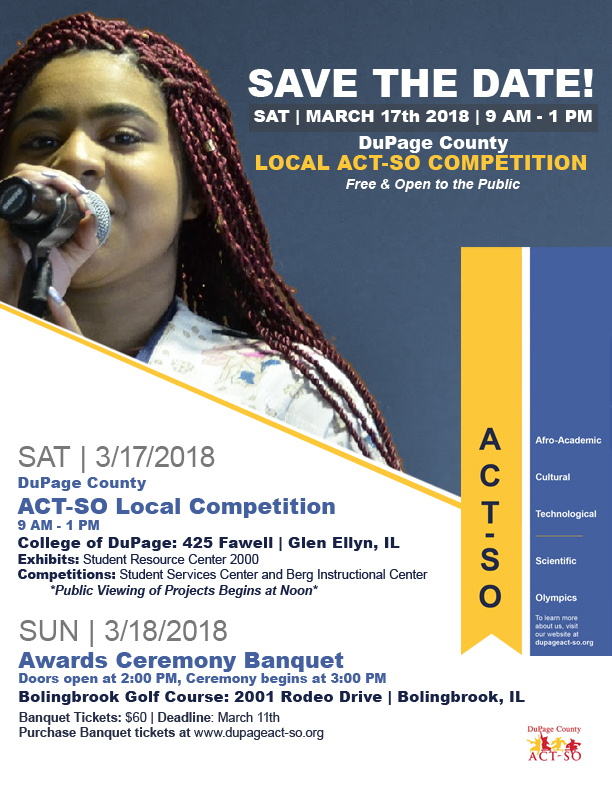 The complete list of 2018 Local Competition winners for the High School ACT-SO and Jr. ACT-SO programs will be available at www.dupageact-so.org or by contacting Dorletta Payton, Chairperson at Dorletta.Payton@dupageact-so.org. The Afro-Academic, Cultural, Technological and Scientific Olympics (ACT-SO) is a major youth initiative of the National Association for the Advancement of Colored People (NAACP). Founded in 1978, by the renowned author and journalist, Vernon Jarrett, ACT-SO provides a forum through which African American youth demonstrate academic, artistic, and scientific prowess and expertise, thereby gaining the same recognition often reserved for entertainers and athletes. To mobilize the adult community for the promotion of academics and artistic excellence among African American students. To recognize academic achievement among African American students in a manner commensurate with the recognition afforded athletics. To provide and assist African-American students with the necessary skills and tools to establish goals and acquire the confidence and training to make a successful contribution to society. NAACP branches and youth units throughout the country conduct annual competitions for students in grades 9 - 12 in the categories of Entrepreneurship, STEM, Humanities, Performing and Visual Arts. The top winners from the local competitions then compete against the winners from other cities at the national ACT-SO finals held during the NAACP's Annual Convention in July. DuPage County ACT-SO’s middle school Jr. ACT-SO program provides a platform for 6th – 8th grade students to improve their analytical, problem-solving, and STEM-related competencies while building their social, presentation and teamwork skills. The program also brings a greater understanding of social and business issues on a local and global level. The students from learn about researching, technical writing, programming web pages, team building and public speaking. The national ACT-SO high school program has helped nearly 300,000 young people open new doors to learning and define career paths since it was founded 40 years ago. Today there are more than 150 ACT-SO chapters around the country helping youth discover and develop their academic and artistic talents. Read the flattering Bolingbrook PATCH.COM article highlighting the 7 local students going to compete at nationals. "BOLINGBROOK, IL — Bolingbrook High School will be well represented at the National ACT-SO Competition this summer. 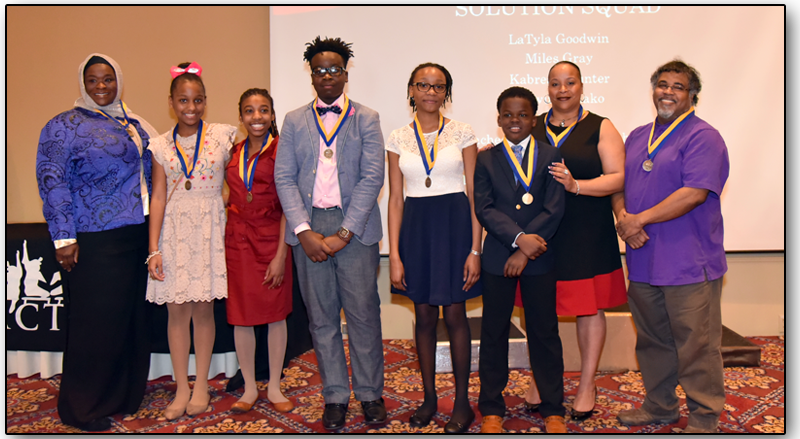 In the month of July, in San Antonio, Texas, seven Bolingbrook students will attend the competition after winning gold medals in the DuPage County trial..."
Hurry! DuPage County ACT-SO Ticket Deadline Extended until March 11th! Deadline has been extended for banquet ticket purchases to March 11th, 2018. Tickets can be purchased online from the DuPage County ACT-SO website at www.dupageact-so.org. "College of DuPage is proud to have long-standing relationships with both Argonne and Fermilab. With an increased national focus on STEM (science, technology, engineering and mathematics), these partnerships are an essential component to our programs of study." View and share the latest DuPage ACT-SO Newsletter or if you missed out on a prior issue of our 2017-2018 newsletters, take a look at our newsletter archive. *Note: It has been reported that some versions of the Microsoft Windows default Mail Program do not show the Newsletter images properly for some viewers. This issue does not seem to happen for any other email viewer (gmail, yahoo, outlook, etc). This is a known issue and hopefully will fixed in the future. In the meantime, if you cannot view those images you can always view the pdf version in the newsletter archive switch to a different email viewer. Sponsored by the DuPage County NAACP! Scholarship amounts range from $500 - $1000!! Applicant and parent must be members of DuPage County NAACP! The DuPage County NAACP is pleased to announce the 2018 Sydney Finley Memorial Scholarship essay competition. Sydney Finley, Jr. is known for his exemplary service to the NAACP as the regional director in the 1960’s and the executive director of the Chicago Southside Branch for six years. The scholarship was established to honor his service and commitment to civil justice, as well as his dedication to our youth and community. The scholarship is open to high school seniors, graduating in the spring of 2018 from a high school in DuPage, Will, Kendall and Kane counties. To participate, applicants and at least one parent/guardian must be a member of the DuPage County NAACP branch by February 5, 2018. The cost of membership is $10 for youth and $30 for adults. To join, students and one parent should click on to: www.dupagecountynaacp.org/membership. The essay contest will be open from January 21 thru February 12, 2018!